News just in from Y.CO of a further $3 million price reduction on White Cloud, jointly listed with Merle Wood & Associates. 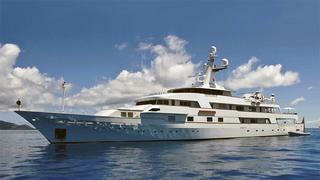 This 67.3m Feadship was built by the Van Lent yard in 1983 with styling by Jon Bannenberg. White Cloud was extended from 60m in 2005, and her interior was redecorated and redesigned by Terence Disdale Design. A large jetted spa pool was added on the aft deck and zero-speed stabilisers were also installed. In 2010, she underwent the 25-year marine survey to maintain her to Lloyd's classification. Her engine control room, machinery and monitoring systems were then upgraded and the exterior was completely refinished. Helicopter capable, White Cloud is now asking $15.9 million.